The ‘zone of proximal development’ (ZPD) is Vygotsky’s term to describe the area of potential learning in which a child can perform an action or task, provided that a more skilled or knowledgeable person is available to help. Vygotsky defined the ZPD as ‘the distance between the actual developmental level as determined by independent problem-solving and the level of potential development as determined through problem-solving under adult guidance or in collaboration with more capable peers’ (Vygotsky 1978). In an everyday classroom context, this might be paraphrased as the gap between a child being able to do a task easily without help or support, and a task which is simply out of reach for the child at the moment and cannot be attempted without guidance and help from someone who is more knowledgeable or skilled. In this way, the ZPD provides a valuable conceptual framework for situating the level of challenge in activities and tasks that may be appropriate for children at any one time – tasks which will challenge, stretch and extend learning but which are also achievable and will allow for success. There is no point teaching below the bottom of the ZPD because the child can already function in a competent and independent way here, and no new learning will take place. Equally, there is no point teaching above the top of the ZPD because the difference between this and the child’s current level of competence is too great. The importance of situating activities and tasks within children’s ZPD from a classroom management point of view is also worth bearing in mind. If activities are too easy, children are likely to become bored, de-motivated and possibly disruptive. If activities are too difficult, children are likely to become anxious, and also possibly de-motivated and disruptive. Closely related to the concept of the ZPD is the metaphor of scaffolding. This was originally developed by Wood, Bruner and Ross (1976) to describe the support provided by adults to guide a child through the ZPD and enable them to carry out a task that they would be unable to do without help. Scaffolding is a metaphor based on Vygotsky’s view of learning as a socially constructed process and is frequently adopted to describe teacher intervention and support in other learning contexts as well. As it implies, scaffolding is a temporary structure or support and can be put in place, strengthened, taken down piece by piece or taken away completely, as the child develops knowledge and skills and is increasingly able to act competently and independently. An important feature in differentiating and defining scaffolding as a particular kind of flexible help, assistance or support is enshrined in its future orientation and in Bruner’s principle of ‘handing over’ the role to the child as soon as he or she becomes skilled enough to take it on. In illustrating the concepts of the ZPD and scaffolding on primary teacher training courses, I have sometimes used the metaphor of teaching a child to swim. In this metaphor, the ZPD is the shallow end of a swimming pool which the child is learning to swim across independently. As any parent who has taught a young child to swim will know, the process starts with the child wearing both water wings and a rubber ring, and being held securely and moved through the water by you. The child then gradually progresses to splashing and moving around confidently on their own, but with you still close-by at arms’ reach, ready to help if need be. At the next stage, the child is ready to discard the rubber ring and learns to kick their legs and move their arms in ‘doggy paddle‘ style, still wearing their water wings, and very often, at first, with you holding your arms out under their body and walking by their side in the water to give psychological, if not real, support. The process continues until the child graduates from water wings to polystyrene float and can eventually (and triumphantly) swim across the pool completely unaided. In this metaphor, the secret for us, as teachers, is to know when rubber rings, water wings or polystyrene floats are really needed and the moment to stand back and let children swim by themselves. In the same class, we also need to be aware that there are likely to be children who still need rubber rings and water wings while others are already swimming around freely like little fish. This metaphor reflects Vygotsky’s concept of learning and deveopment as the result of joint participation in goal-oriented activity: ‘What the child can do with assistance today, she will be able to do by herself tomorrow.’ (Vygotsky, 1978). It can be argued that it is only when support and assistance through such things as water wings are needed that learning actually takes place, because it is only then that activity is taking place within the child’s ZPD. Note: This posting is closely based on articles I have previously written on the same topic (see references below). 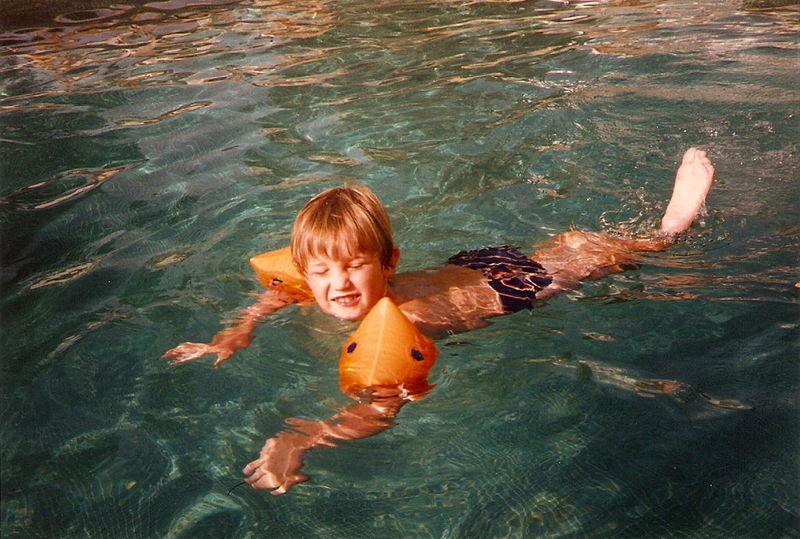 Photo: Jamie Matthews learning to swim. I am planning to use your ABCs as part of a pre-course reading assignment for the YL extension to CELTA course we are running next year. It is accesible, on point and enjoyable to read. Many thanks for writing and for this positive feedback. I’m delighted the blog may come in handy as pre-course reading on your YL Extension to CELTA course. Do encourage your trainees to contribute their thoughts if they feel inspired! Hope the course goes well! Many thanks for writing. So glad you think it will help!! I’ve often found it’s a metaphor that trainees can run with … Do share how it goes! This really is a brilliant blog. You have so many ideas that really are useful. Many thanks for writing and for your encouraging comments. Just wish there were a few more hours in each day to keep the posts coming …! Carol, I am talking to teachers tomorrow about Oracy and wondered if you would mind me presenting your O is for Oracy page to them. We all recognise the need to improve the way in which we teach the students to structure their oral responses – I thought the Q&A session would be really useful – would it be alright to expose your ideas to us in East London on a cold and rainy Wednesday morning? Yes, please do go ahead – that’s what the blog is there for! Hope the Q&A session is useful and leads to a stimulating discussion. Do encourage your students to add any thoughts or comments to the blog. All the best from sunny Madrid!